And now she has a BOOK! I bounced and tried to stay busy with other projects until it arrived in the mail. Let me honestly say, it met my expectations for an explosion of color and creativity. 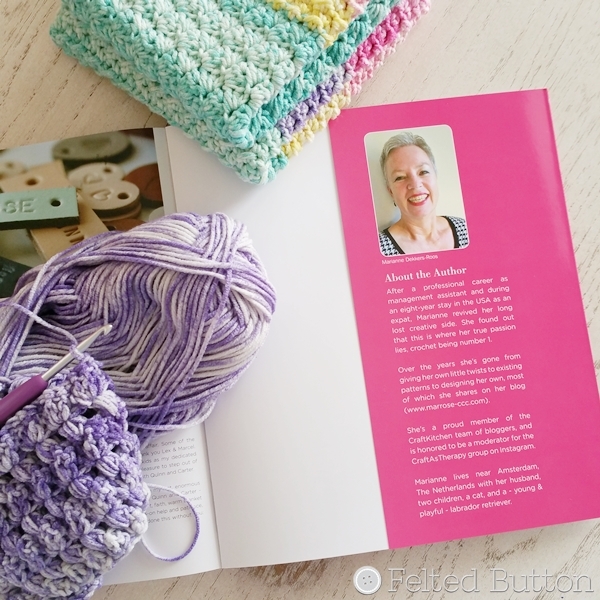 So, I immediately began thumbing through the pages of the lovely book and was off to rummage through my yarn stash to get started with some projects in the book. 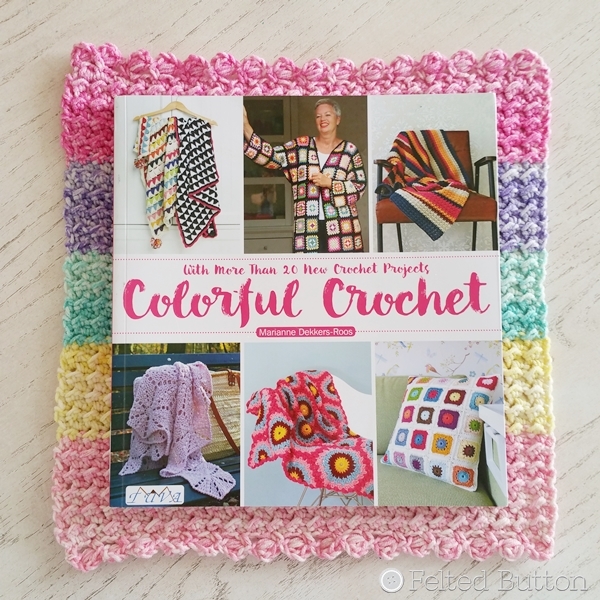 It includes clear, yet simple, patterns instructions--including charts, designer tips and options for making one design into something completely different--like a solid-colored blanket into one with several colors, a scarf into a blanket, even a pillow cover into a vest. I like that versatility which allows you to make something uniquely suited for you. The pictures are inspiring and "personal". I love that Marianne is in several--showing her own style and personality. Really cool idea! 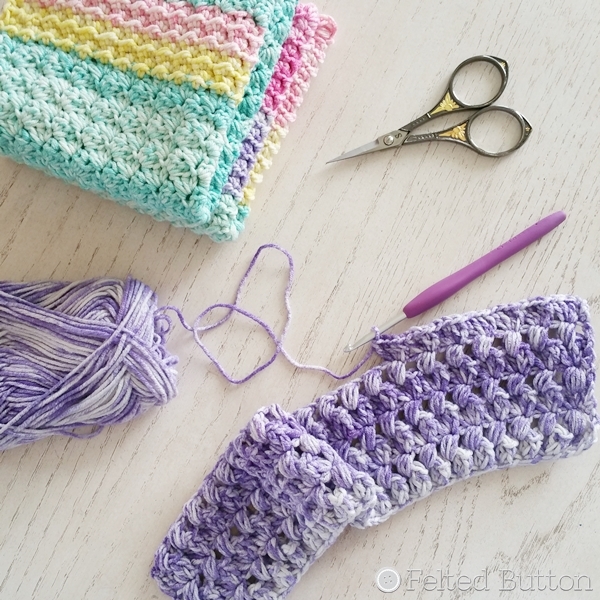 In the back, Marianne shares some crochet tips that are really clear and helpful, if you encounter something that is new to you. Another personal touch is her details about the individual designs--for whom they are named and what they mean to her. Again, I like that I feel like I get to know her better through the pages. This book has inspired me to get my hook flying on my own project found within its pages. 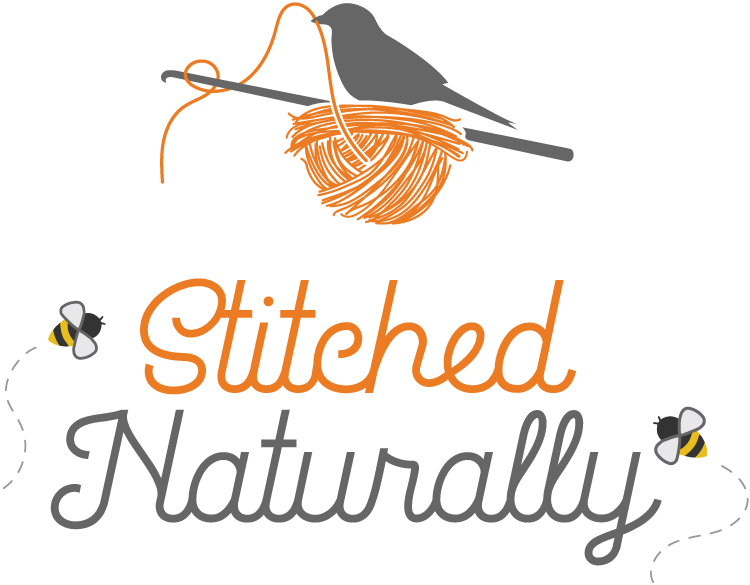 I was particularly intrigued by some of the stitch patterns. They all had amazing texture that were calling my name. So...let me show you what I've been working on. I pulled my Scheepjes Softfun Aquarel* out of my stash because the colors felt so..."Marianne" to me. 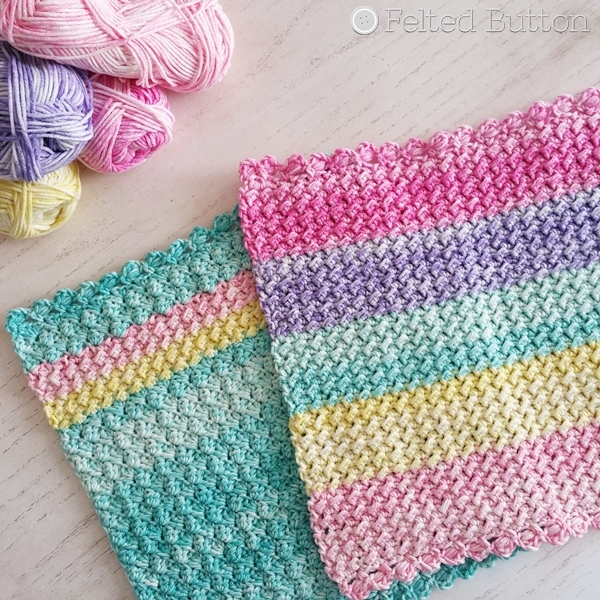 I decided to make some wash cloths from this super soft cotton blend where I could play with the textures of three of Marianne's blanket patterns in the book. 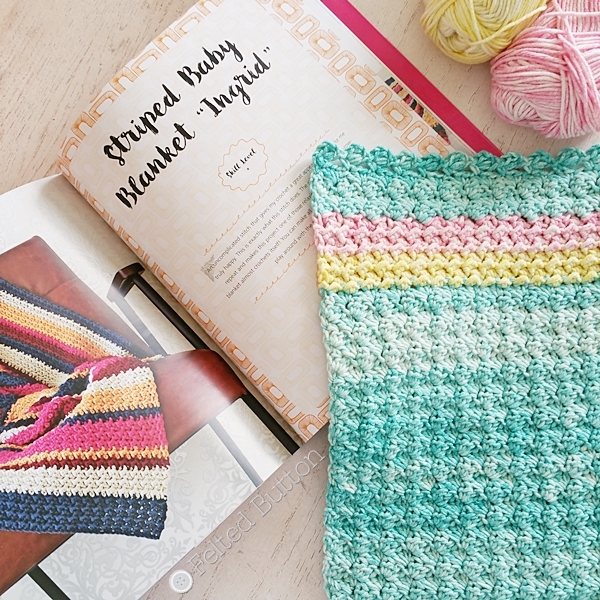 The one to the above left is from her blanket design called Striped Baby Blanket "Ingrid". Wowza! Would you look at that texture?! 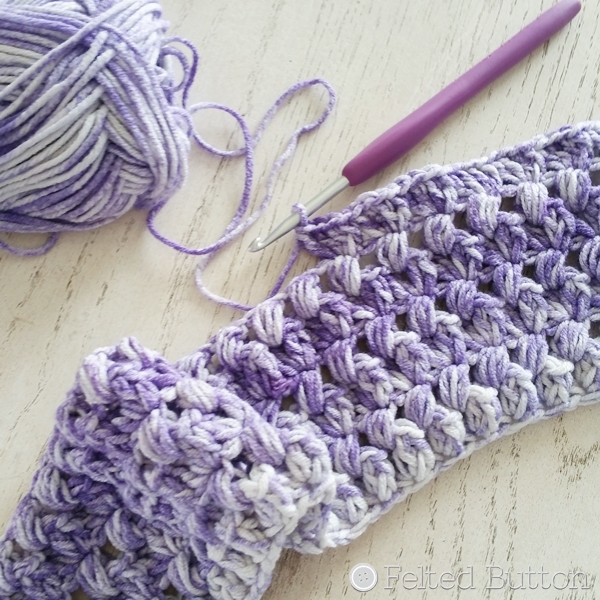 I'm simply tickled with the texture and rhythm of these stitch patterns. And the border is simple, yet lays flat. I like that. 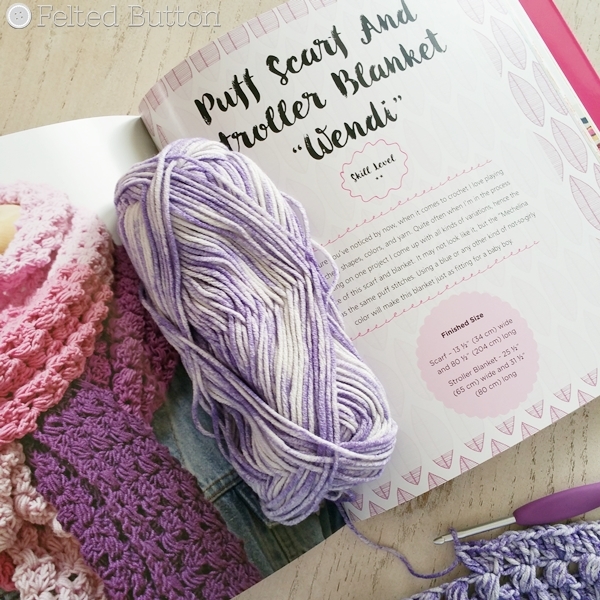 Finally, I had to try the Puff Scarf and Stroller Blanket "Wendi" pattern. This one is super squishy with delightful texture. I'm really pleased with how all of these came out and imagine that the full blankets that Marianne has designed are in my future. For now, these cloths will have to do. ...enter my giveaway to win a copy! 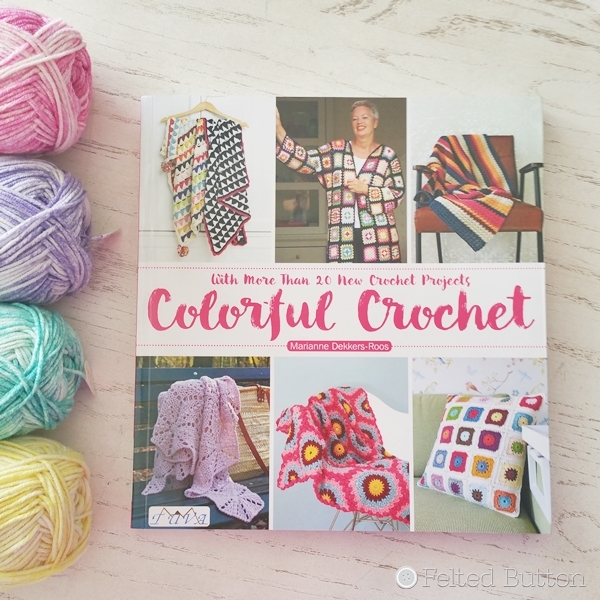 All that you need to do is comment here on this blog post with your favorite color scheme and I'll select a winner to receive it (US folks only; selection made 6/7). Make certain you are logged in to comment because "Unknown" folks are not included. If you are outside the US, continue to follow the blog tour because there are additional opportunities to win from other bloggers. Thanks! You can also follow along on the blog tour to have more chances to win. 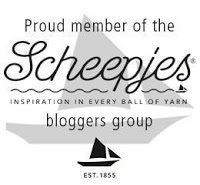 I'm following in line from the talented Shelley Husband of Spincushions and sending you off to follow Sharna Moore of Sweet Sharna. 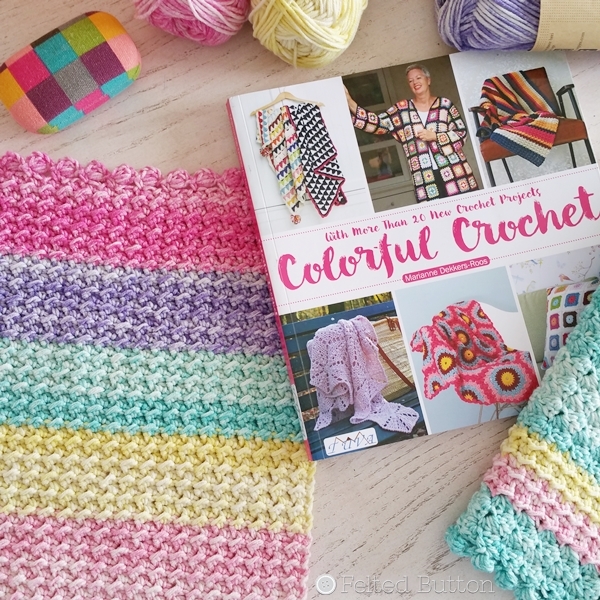 Be well, and happy crocheting! *This post contains affiliate links. Using these links will cost you no more but will allow me to continue blogging and providing free patterns. Thanks! Blue, green and yellow. Looks like a great book. HI,this Book looks so neat! Love to win it! Love aqua+cream.Thanks for sharing! And, Whoa! What an excited review! I really like getting "the facts" on a new book. It makes me know whether I want to purchase it if I don't win a copy. Important, huh? I have several books from recent blog reviews now. I really like the color scheme of the piece under the book. Such sweet colors. 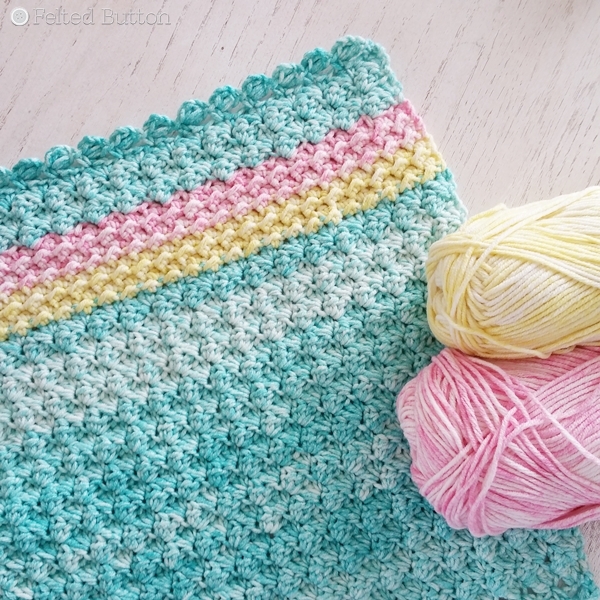 Perfect for something summery or for a newborn. The book looks wonderful. Thank you for the giveaway! I love them all.. I live in the US and order lots of my yarn from the U.K.... we can't seem to get the beautiful yarns over here.. 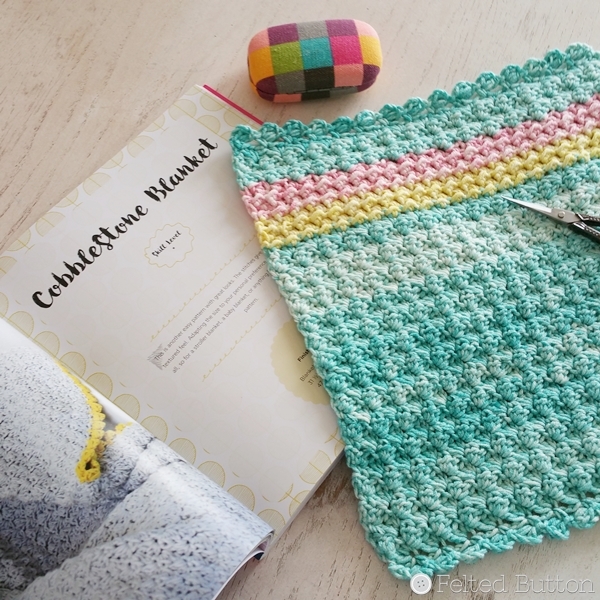 I love the aqua colors and the patterns looks awesome... would love the book to try a few myself. Anything pastel! Especially pastel rainbows! 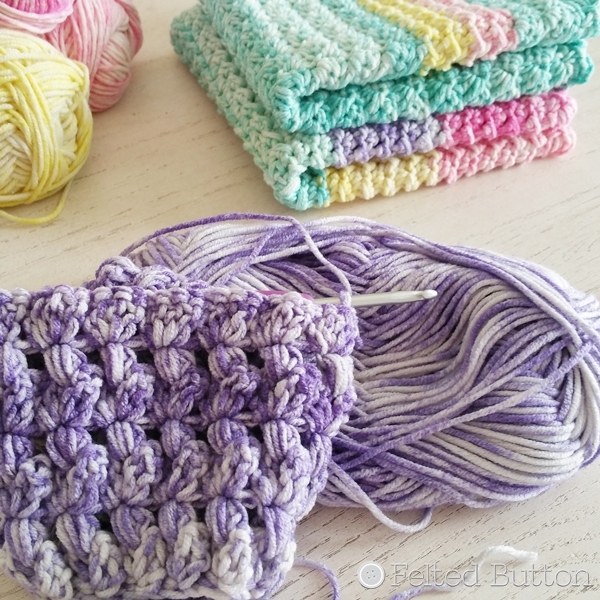 My next project with stylecraft special dk. Congratulations!! You have won a copy of this book! Please contact me at feltedbutton at gmail dot com to claim you prize and give me your mailing address! I'll get it shipped off to you soon! They turned out deliciously! I love shades of red. Ombres of gray and blue. And mixes of green and brown. And more! Thanks for sharing and an opportunity to win!! Happy hooking! I love working in the rainbow - ROYGBIV with a solid color contrast. My last bag was a dark green with a rainbow band. Hope my sister likes it. It's for her. I love your work, Susan, and am really inspired by it. Thank you. I like the lilac mix,soothing. I like what I call "sherbet" colors, somewhere between pastels and brights. So cheery. I also love the cool colors together (blues, greens, aquas, teals). I find them soothing. I love pinks but especially love pink with gray! love all the colors looks like a lot of fun to work with! I love the bright colors. My favorite combo is turquoise/purple/pink. I love coral, light grey, and navy. Thanks so much for the opportunity! I love blues, greens, yellow and pinks with shades of greys. I most color schemes.